1.a drawing room or reception room in a large house. 2.an assembly of guests in such a room, especially an assembly, common during the 17th and 18th centuries, consisting of the leaders in society, art, politics, etc. 3.a hall or place used for the exhibition of works of art. A good salon fills you up emotionally and intellectually. 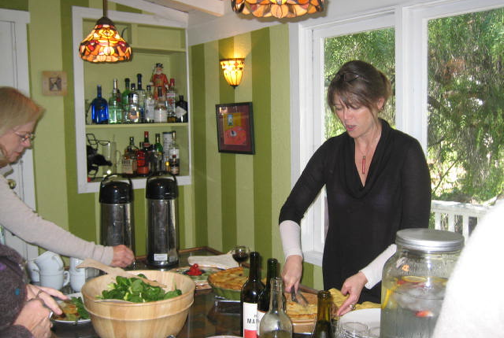 A literary salon could be described as a pie--a pie filled with all sorts of delectable goodies. You slice into the pie discovering the cook’s surprising combination of flavors and ideas. A savory pie, colloquially called a pot pie, is also consider a comfort food. I love to bake and share savory pies, and I love chatting about literature with my friends. What better way to combine my two favorite things: Savory Salons! Savory Salons (and workshops) take place in my living room in historic South Park neighborhood of San Diego, California. To make the salons intimate and truly about getting to know the literati on a personal basis they are limited to 8-10 people. We nosh and chat. We will write, if we are so inclined. Some salons will be daytime events, some evenings. Some are workshops. Occasionally autographed copies of the books will be included in the price when the author so desires. Some will include gift bags, sometimes foot and hand massages, once in while music. And sometimes it won’t be about literature at all, but maybe photography, music, dramatic arts, whoever I have a whim to invite and they accept. All salons will include pie (maybe a sweet pie if that’s what is inspired, but mostly savory). Each salon will be different, delicious and delightful, if I dare be so alliterate. I hope you will come join me and share some comfort food, some camaraderie and fill your soul. Oh, and who am I? www.amywallen.com I write, I bake, I review, I edit, I trip over the carpet on occasion. Quite often, actually. Check out the blog for details on upcoming salons. So far they have all sold out before I can even advertise.